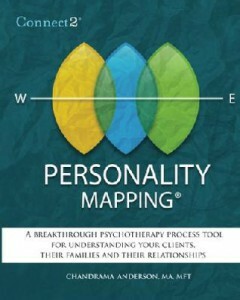 Connect2® Personality Mapping: A Breakthrough Psychotherapy Process Tool for Understanding Your Clients, Their Families and Their Relationships. Available at Amazon.com. You are the clinician that wants to know and understand the patterns and intersections of your patient’s life. You want to connect the dots and see how the big picture and the tiniest details overlay to create the landscape of her life and relationships with family, friends, partner, and self. You want to see the “here be dragons” portion of the unconscious. You want to know the depth, breadth and height of his experiences that has led to now, to you. Connect2® Personality Mapping is a powerful guided psychotherapeutic process tool designed to explore the layers of the physical and psycho-emotional Self with individuals, couples and families. It is a way of illustrating, in black and white and color, an individual’s maps of her intra- and inter-personal relationships. The purpose of Personality Mapping is to examine and integrate those maps, within your particular theoretical orientation. Simply put, the end-goal is to alter the maps, transform the brain, and reframe feelings and responses so that they become rich, appropriate and authentic.